Part of the fun in having the children in your life grow older is their increased abilities. This is never truer than when it comes to crafts. While very small children are limited in their ability and their patience in making crafts older kids all the way up to teens often love crafting and have the skills and patience to complete more complicated projects. 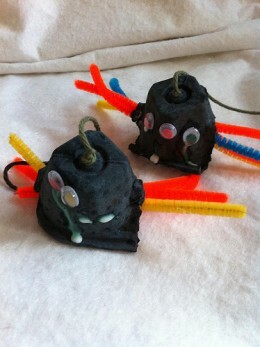 · Egg Carton Spiders-Since this project require the use of scissors and a small screwdriver older kids can take this on well. Using the scissors cut the egg carton apart into little cups/sections. Carefully using the awl or screwdriver, make eight holes in the bottom edge of each section for the legs. Paint the entire egg carton section black. Let dry completely. Cut the pipe cleaners in half. Carefully push the pipe cleaner in through one side of the section and out the opposite side. Bend down the legs. Repeat the process for each of the legs. Glue on wiggle eyes.